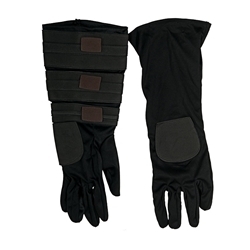 The Anakin Skywalker Gloves are a pair of gloves as pictured which come in Adult One Size Fits Most. Harness the power of the force with the Anakin Skywalker Gloves! These officially licensed gloves are of the style worn by Anakin Skywalker in Star Wars: The Clone Wars. Pair with any of our Jedi Costumes and Lightsabers, and you too can balance the power of the Light and Dark sides this Halloween!